We are in the thick of it now. Winter weather patterns blanket much of the country and the rut is either in or about to be. The one constant in your hunting regimen is that no matter how many additional layers or scents or call accompany you to the stand, you’re always toting your bow. Even as the rifle shots of a Saturday afternoon give the impression of July 4th before sunset when everyone is “testing” fireworks. 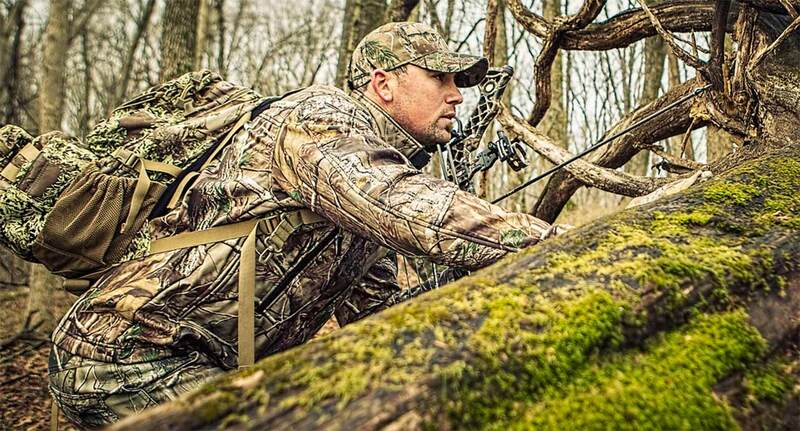 As the temperatures and precipitation fall, so do the leaves; that natural concealment the majority of bowhunters rely on in September and October. This doesn’t mean, as many of you know, quit hunting for the year, or even exchange the bow for a rifle. Instead, just a few extra precautions can keep you in the game as if it were opening weekend. Deer don’t have a tendency to naturally look up unless they hear something. Detection can be avoided by staying stone still during the early season as they crane their necks around for different-angles looks. But when there’s not much background to protect you, climb higher than you normally would. If a prominent trail is near your stand, this will steepen the angle considerably and lessen the chance of a deer looking straight up at you. Just be sure to find a tree that remains sturdy even at 40 or 50 feet and doesn’t move too much in stiff winds. Carry a saw to trim limbs as you climb. Obviously you set a stand to face the way deer approach from. But there won’t be much to hinder you if you ease it to the back of the tree. Don’t move it all the way to the six o’clock position. Place it at about five or seven depending on approach routes and which hand you shoot with. You’ll have to rotate between standing and sitting unless your legs allow you to remain upright for a few hours at a time. This is one time hugging a tree is really okay. Each time you climb, you could haul up an evergreen limb to place above you for a canopy. That is, if there are strong branches to hold limbs. This will create an umbrella effect to break up your silhouette. Ground blinds will also eliminate your silhouette. However, serious bowhunters know that treestands allow us a lot more freedom in movement and placement. Learning leafless concealment will give you more days in the stand with less chance of getting busted.